All the birds lived happily together in the forest. One morning they were talking together. An owl named Jack told about a strange experience he had one year ago. It was in the middle of a cold winter night. He heard a bell tinkling in the sky far away, and saw something flying that didn't look like a bird. Bernard, the curious 7year old bird ,was very interested in the story. He wondered what could fly if it wasn't a bird. Bernard thought of Madame Gloria, who lived in a luxurious mansion at the edge of the forest. She had lots of friends, so Bernard thought she might know what the flying object was. 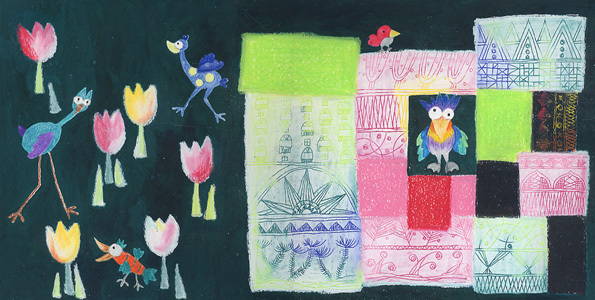 He invited the birds to join him and visit Madame Gloria. When they arrived at Gloria's house they saw that her friend Jojo had come for a visit. They told Jojo about the mysterious flying object, and Jojo said that it might have been Santa Claus. Jojo explained that on Christmas Eve Santa Claus flies around the world on a sleigh delivering presents to children, putting gifts under Christmas trees. Bernard and the other birds decided that they wanted to try to see Santa Clause this year, but it would be hard because all birds except for owls can't see very well at night. The birds discussed what they could do to get a glimpse of Santa Claus, and they thought of a plan. First they would set up a huge Christmas tree, covered in lights. Santa would be sure to see it, and all the lights would make it easier for the birds to see anything that came near. But the birds wondered what they could do to light the tree. Jojo told the birds that there is a kind of insect that flashes a bright light on its tail. Bernard asked Jojo where to find fireflies, and Jojo took Bernard and several birds off to collect them. Madame Gloria loaned the birds a mirror and sparkling jewels to put on the top of the tree so that it would be easy for Santa Claus to see from far away. If they let the fireflies loose when Santa came near, they would light up Santa for all the birds to see. 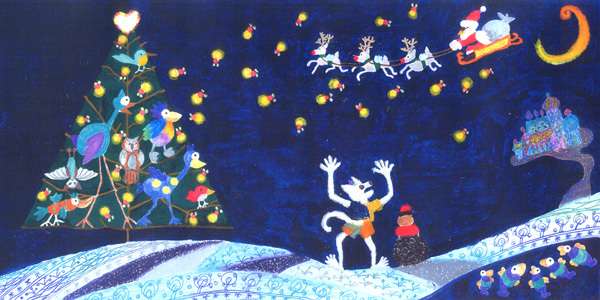 On Christmas Eve Bernard and his friends put the jewels and the mirror on the top of their Christmas tree. Then they waited for Santa Claus to come. When they heard bells tinkling in the sky far away they let loose the fireflies. Santa noticed a single tree sparkling radiantly in the middle of the dark night, and he flew closer to see what it was. Hi. 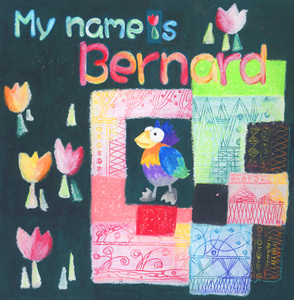 My name is Bernard. I live with lots of other birds in the forest. Today we are talking together, like we do every day. Jack, what a strange tale. I wonder what can fly if it isn't a bird? Oh, I've got a good idea. You know Madame Gloria, who lives in a luxurious mansion at the edge of the forest? She has lots of friends and she knows a lot. Sheﾕll probably know what it was. Come on, let's go visit Madame Gloria. We would like to ask you a question, Madame Gloria. and saw something flying that didn't look like a bird. What else but birds can fly in the sky? Gloria's friend Jojo said, "That might have been Santa Claus. putting gifts under Christmas trees. Okay, everything's ready! We're set. It's sure to go just like we planned it. Let us decorate the Christmas Tree with these glittering jewels and the mirror. Look everyone, look over there! Wow! Here he comes. It's Santa Claus!